"Ok, it's the Fighter's turn. What do you do?" "That's the 5th round in a row you've swung your sword"
"Yeah, well, there ain't much else to do, is there?" Au contrere, mon frere! Why let all the flashy combat maneuvers be left to wizards and sorcerers? With Spheres of Might, now fighters, rogues, and other martial classes can get some cool tricks to pull. The book is up on Kickstarter now. 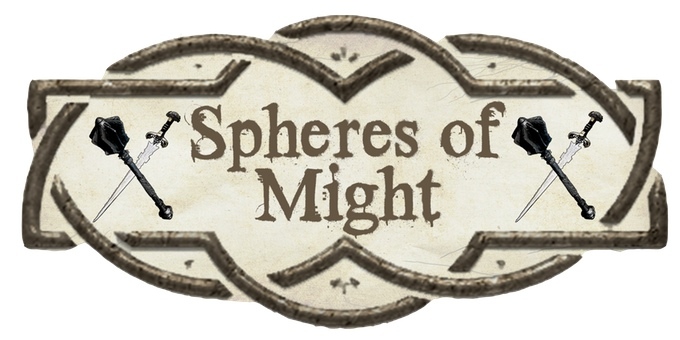 Spheres of Might is a new system for handling martial prowess in Pathfinder and other D20 roleplaying games. Barbarians, swashbucklers, knights, rogues; in the world of high adventure and fantasy roleplay, few things are as iconic as the martial warrior. From Conan the Barbarian, to Aragorn, or King Arthur and his knights, these champions of steel and valor stand on the front lines, battling foes beyond the comprehension of lesser mortals, and make the impossible seem like child's play. Spheres of Might is a book for them. The Kickstarter campaign is going well. They're more than double their funding goal. However, there's only 5 days left to jump in on it.